That the cure for high prices, is high prices, was once again shown this week. Among the monthly data, there was a nice positive surprise in the rise of 0.8 in the Leading Economic Indicators, as a big increase in housing permits largely cancelled out declines in manufacturing data. This appears to take outright recession off the table for the immediate future. 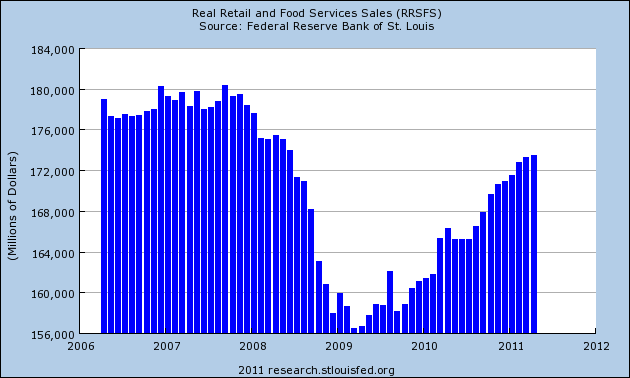 In other news, retail sales declined -0.2 mainly due to auto purchases. Ex auto they were up +0.3. The CPI came in a +0.2 with a slightly hot core reading of +0.3. Manufacturing continued to cliff dive, as both the Empire and Philly indexes were surprisingly negative. Industrial production was up +0.1, and capacity utilization was unchanged, but only because April was revised down -0.2. Consumer confidence declined slightly. As indicated above, housing starts increased +19,000 and permits were up +49,000 to one of highest levels since Jan 2009. All of the scary, double-dippish bad news resulted in Oil finishing at $93 a barrel on Friday, which is slightly below the level of 4% of GDP for the first time in about five months. This level, according to Oil analyst Steve Kopits is the point at which a recession has been triggered in the past. Gas at the pump fell for the fourth week in a row, declining $.07 more to $3.71 a gallon. Gasoline usage at 9370 M gallons was slightly higher than last year's 9338. This is the second time in three weeks that gasoline usage has exceeded last year, after a two month period of negative YoY comparisons. In other words, the Oil choke-collar is relaxing. The Mortgage Bankers' Association reported that seasonally adjusted mortgage applications increased 4.5% last week. It was 6.1% higher than this week last year. This is the fourth week in a row that YoY comparisons in purchase mortgages were positive. Except for the rush at the two deadlines for the $8000 mortgage credit, these are the first YoY increases since 2007. Refinancing increased 16.5% w/w with the continued decline in mortgage rates. YoY weekly median asking house prices from 54 metropolitan areas at Housing Tracker showed that the decline abated to -4.5% (Note: Housing Tracker just made the total US weekly number available, so I am using that weighted average instead of the unweighted median). The areas with double-digit YoY% declines decreased by two to 9. The areas with YoY% increases in price increased by two to 5. The BLS reported that Initial jobless claims last week were 414,000. The four week average remained the same at 424,750. We have at least stabilized under 430,000, but this is still considerably higher from earlier this year. Railfax was up 2.9% YoY for the week, or 24,200 carloads. Baseline traffic is up only 1.53% from a year ago. Cyclical traffic is up 3.12% YoY. Intermodal traffic (a proxy for imports and exports) is up 3.95% compared with a year ago. The American Staffing Association Index increased 1 point. The index has been rebenchmarked, so the new value is 87. This series is just barely trending positive. It is weaker than early 2007, but stronger than early 2008 or 2009. This is just barely above a stall, and is a significant danger sign. The ICSC reported that same store sales for the week of June 11 increased 2.4% YoY, and decreased -0.8% week over week. The yearly comparison here, while still good, has been decreasing in the last few weeks. Shoppertrak reported a 3.3% YoY increase for the week ending June 11 and a WoW decrease of 4.6%. The w/w declines were anticipated due to Memorial Day seasonality. Weekly retail sales numbers are still a bright spot, generally showing the consumer not rolling over due to gas prices. Weekly BAA commercial bond rates increased .03% to 5.73%. This compares with yields on 10 year treasury bonds decreasing .01% to 3.00%. The continuing decline in treasury rates shows fear of deflation, and the increase in corporate rates shows a slight increase in relative distress in the corporate market. 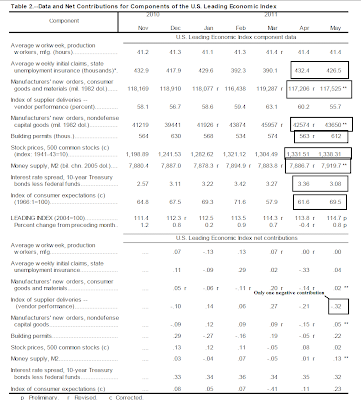 Adjusting +1.07% due to the 2011 tax compromise, the Daily Treasury Statement showed that for the first 11 days of June 2011, $75.5 B was collected vs. $77.5 B a year ago, for a decrease of $2.0 B YoY. For the last 20 days, $127.6 B was collected vs. $119.7 B a year ago, for an increase of $6.9 B, or 6.6%. Use this series with extra caution because the adjustment for the withholding tax compromise is only a best guess, and may be significantly incorrect. M1 was down -1.1% w/w, up 1.3% m/m, and up 13.5% YoY, so Real M1 was up 10.1%. M2 was up 0.1% w/w, up 0.3% m/m, and up 5.2% YoY, so Real M2 was up 1.8%. In summary, the coincident data shows a stalling recovery. The leading indictors, and the relaxation of the Oil choke collar on growth, suggest that the stall will not turn into an outright recession, and that stronger growth might resume in a few months. The Conference Board Leading Economic Index® (LEI) for the U.S. increased 0.8 percent in May to 114.7 (2004 = 100), following a 0.4 percent decline in April, and a 0.7 percent increase in March. The largest contributions came from the interest rate spread, consumer expectations, and housing permits. In the above chart, notice the majority of indicators were up and only one contributed negatively to the report. Despite the bearish news of the last few weeks, this is a welcome upside surprise. As the posts from the Beige Book this week indicate (see these posts on consumer spending, manufacturing, services and lending to catch-up) the economy is clearly slowing down. The combination of high gas prices, political uncertainty (domestic and international), aftereffects of the Japanese earthquake and the slowdown in emerging economies are all hitting US growth. The question now becomes -- what is the length and total impact? Let me answer that by looking at the various economic sectors specifically outlined in the Beige Book. 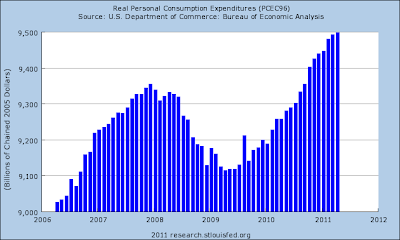 Consumer spending is being hit by weak wage growth, (caused by) high unemployment and high commodity prices. To the extent high commodity prices are responsible, we're seeing consumers change their overall spending from discretionary goods to necessities. In addition, to the extent gas prices remain high, we'll continue to see a change in car purchasing behavior from heavier trucks and SUVs to more fuel efficient cars. High unemployment leads to future uncertainty which causes depressed spending and more saving. While the former has an obvious negative impact, the latter does have long-term benefits as it provides a safety cushion for consumers. Manufacturing is clearly seeing a slowdown caused by two factors: Japan and the slowdown in India and China. Japan is hurting supply chains across the globe. Estimates for when the problem will be cleared up have ranged from the third to end of the fourth quarter. 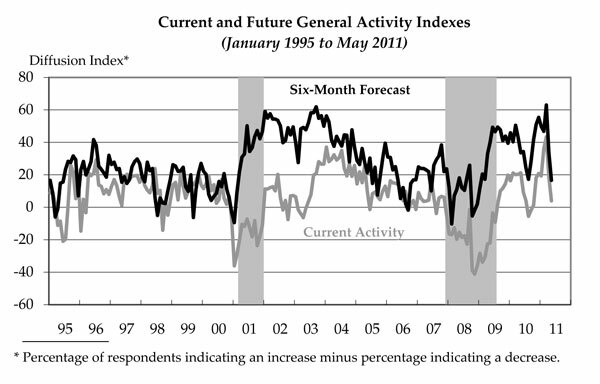 Of importance here are the future indicators in the various Federal Reserve surveys. So far, we've seen these drop sharply over the lat two months, indicating there is a general sense of concern in the manufacturing community about something. As for emerging markets, both China and India are trying to tamp down high inflation, which is still at higher than desired rates in both countries. As such, their respective interest rates will continue to increase, slowing domestic growth. This combined with the aftereffects of the Japanese earthquake will slow US domestic manufacturing. Services: As an aside, there is actually precious little information on the service economy, save for a few regional surveys and the ISM national data. The latest ISM report is actually positive, with signs the service sector is expanding and expecting more of the same. The federal macro level Beige Book report was solid, and the various districts reported strength as well. Commodity Prices: The primary driver for the recent spate of high commodity prices has been tight supply and increased demand. On the agricultural side, this mis-match started last summer when Russia was hit by a summer of burning crops, which forced the government to ban exports, leading other countries to hoard grains. Combine that with a year of odd weather across the globe impacting supply, and you wind up with tight agricultural supplies. On the oil side, we have increased demand from a growing India and China and tight supplies out of OPEC that also has little spare capacity left. Both of these scenarios indicate that a slowing economic environment will decrease upward price pressures, thereby easing some of the problems caused by high commodity prices. Real Estate: the economic basket case. The good news here is the pace of sales has stabilized, although at an incredibly low level. In addition, home affordability is at great levels, the rent/buy decision tree indicates that owning is better than renting and interest rates are still at incredibly low levels. In short, real estate is clearly a bargain. On the con side, unemployment is high, credit is still tight and there is a tremendous amount of overall uncertainty in the air. However, the fact that real estate is already at terrible levels means that it is highly unlikely it will move lower. As real estate drops are a big cause of recessions, this fact is actually a good thing, as it indicates one of the primary drivers of recession probably won't cause another. Employment: Last months reports was one report in an otherwise good string of reports. The obvious question is what is the overall trend? The latest indications from initial unemployment claims are positive, but not overwhelmingly so as the total figure is still above 400,000. In addition, with the economy entering a soft patch it's logical to assume that hiring plans will be at least marginally depressed. In short, there is little reason to see a huge pick-up in this number. However, there is also little reason to see a high drop-off either. Frankly, it seems as though the economy cut-out 10% of the overall workforce about two years ago and has moved one without looking back. Overall, there is no reason to see a double dip. But neither is there a reason to see a pace of strong overall strong growth. It's quite likely that for the next few quarters the economy will grow just enough to stave off a recession, but not fast enough to create a self-perpetuating, demand driven state of strong growth. While prices have rebounded into the EMAs, the increased volume since the latest bottom indicates the chart may be in the middle of a selling climax. That is giving me pause for now, as we may be seeing a change in overall momentum. Although prices have rebounded into the EMA, I would wait until prices move below previously established lows before shorting. At minimum, prices could be starting to form a sideways consolidation pattern -- probably a triangle consolidation pattern. The high volume appears to be signaling a selling climax. Prices have rebounded through all the EMAs, and all three EMAs are now moving higher. The 10 day EMA is about to cross above the 20 day EMA. 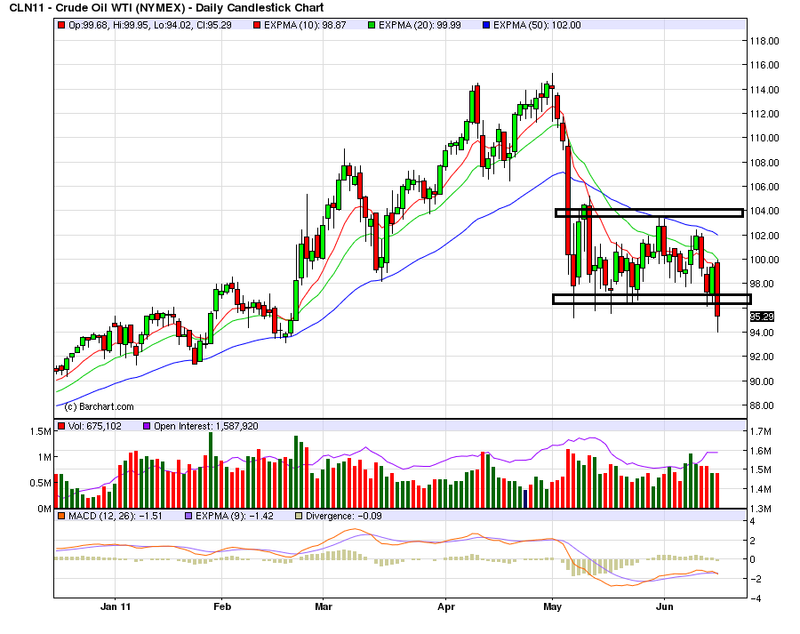 On the technicals, note teh A/D line spiked higher and the CMF is now slightly positive. Also note the MACD has given a buy signal. Ironically, demand for the US dollar is inversely proportional to the strength of US fundamentals. As the US economy has rebounded, investors have become more comfortable about risk, and have responded by unloading safe haven positions in the dollar. 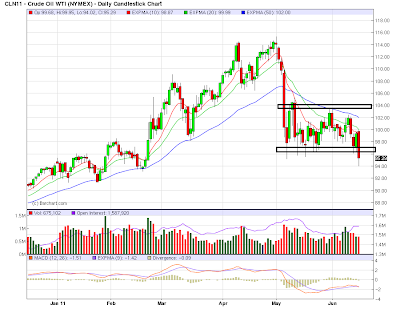 With the US recovery faltering, investors are slowly moving back into the dollar, re-establishing safe haven positions. While the dollar faces some competition in this regard from the Franc and the Yen, it still compares favorably with the euro and pound. With the midyear economic stall (that I told you in January was going to happen) well and truly in the forefront of recent data and punditry, I thought it would be worthwhile to look at what components are and are not driving it. These are the 7 harbingers of economic slowdown I wrote about as leading indicators for last year's event. This index hit an air pocket in April - May 2010. There has been a much more muted decline this year - which makes it all the more odd that ECRI has voiced much more concern about a "global slowdown" this year than it did last year. Incidentally, this is also why I follow the totally transparent LEI more closely than this index. This market, rather than the NYSE, leads the world. The bursting of its bubble in 2007 heralded the "great recession," and it bottomed months before Wall Street. While the index hasn't made a new high in the last year, it also hasn't made a new low. That it is going sideways isn't good, but it doesn't portend an economic downturn at this point, either. This index is off its comatose lows, but isn't even half as concerned as it was last year, let alone during the 2008 crisis. (h/t Mortgage News Daily). Unlike last May, when the expiration of the $8000 housing credit created a steep downdraft, this index has generally trended sideways now for over a year. It's also worth mentioning that housing permits had one of their best months in two years in May, with over 600,000 being issued. If house sales aren't going down, where is the source for a big economic downturn? Without the ability to take on new debt, or to cash out appreciating assets, price increases hit ordinary American white and blue collar workers hard, and immediately impact spending. This stressor is worse than last year, where the price of Oil never breached the 4% limit. During the bull market of 1982-1998, bond yields and stock prices were mirror images. Since 1998, whenever fear of deflation has become a meaningful issue, bond yields and stock prices have instead moved in tandem. One item that is different this year is the impact of supply chain disruptions due to the earthquake in Japan. It has been speculated that the recent higher initial jobless claims were due to layoffs in factories dependent on this supply chain. That is said to be abating - but it is just in time for Washington's austerian stupidity to kick into high gear, forcing perhaps hundreds of thousands of state and municipal layoffs due to the expiration of federal aid to state budgets. In summary, the driver of the current slowdown appears to be primarily high Oil price and low wage growth, with an assist from Japan's earthquake and contractionary policy emanating from Versailles. The Empire State Manufacturing Survey indicates that conditions for New York manufacturers deteriorated in June. 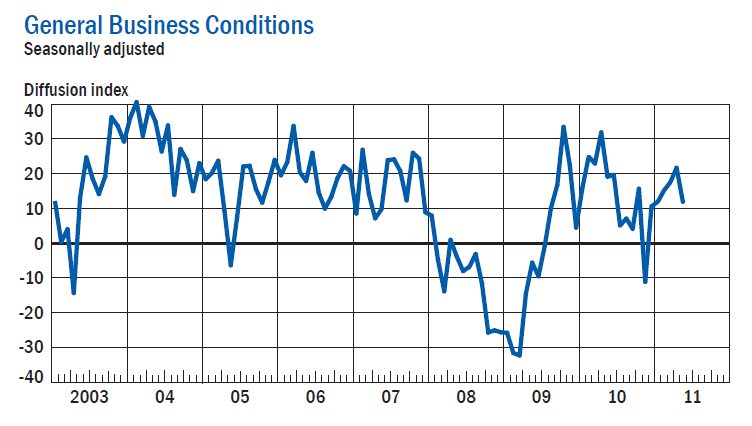 The general business conditions index slipped below zero for the first time since November of 2010, falling twenty points to -7.8. 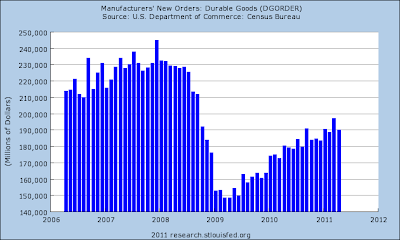 The new orders and shipments indexes also posted steep declines and fell below zero. The index for number of employees dropped fifteen points to 10.2. The indexes for both prices paid and prices received were positive but lower than last month, suggesting that increases in input prices and selling prices had slowed. Although future indexes were generally above zero, thy were well below last month's levels, indicating that the level of optimism about the six-month outlook had deteriorated significantly. The index dropped hard at the end of last year, only to rebound fairly quickly. However, unlike the end of last year, there has been a broad-based drop across a variety of regional manufacturing surveys. In addition, the future expectation number also dropped, telling us that survey participants are becoming more concerned about the future. Note the fairly extreme impact of Japan's earthquake, and, to a lesser extent, the weather in the midwest. There is further evidence that the Japanese situation is contributing to the slowdown: Japanese exports have dropped sharply, as have US imports from Japan. 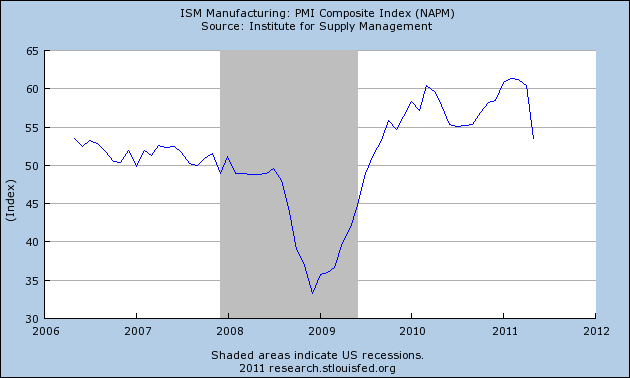 The above charts point to a manufacturing slowdown. We've seen overall industrial production and capacity utilization slow their rise. In addition, several regional fed manufacturing surveys have slowed as well, and the latest ISM print showed a severe drop. 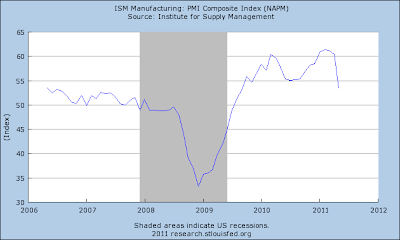 There is a manufacturing slowdown taking place. That leads to the following question: is this a temporary or permanent situation? As mentioned above, the Japanese earthquake had a strong negative impact. However, China has recently raised its reserve requirements again, India has raised rates again, the Greek situation is still hurting the EU region and the latest OECD leading indicators point to slower growth. Right now, the breadth of the data indicates the slowdown is permanent. Terrorist group Al Qaeda's selection of former number 2 Ayman al-Zawahiri as its new leader was confirmed this morning when detonation of a suicide bomber sent up white smoke. Previous suicide bombers had sent up black smoke, signalling a deadlock in the process . . . .
Let's take a closer look at the banking/lending component of the Beige Book. Most Districts described loan demand as mixed or slightly improved since the last report. Consumer loan demand showed some improvement in the Cleveland, Richmond, and St. Louis Districts, but held steady or weakened in the New York, Atlanta, Dallas, and San Francisco Districts. Demand for residential mortgages (including new purchases and refinances) increased in Cleveland but held steady in New York, Richmond, St. Louis, and Kansas City. Contacts in the Philadelphia, Cleveland, Richmond, Atlanta, Chicago, Dallas, and San Francisco Districts noted a modest uptick in business loan demand. The increase in business loan demand in Cleveland was described as broad-based, including a pickup in construction loan requests for multi-family dwellings. Boston noted an improved lending environment for commercial real estate, and demand for commercial mortgages increased in New York and Dallas. Commercial and industrial loan activity increased in Richmond, Chicago, St. Louis, Dallas, and San Francisco, held steady in New York, and decreased in Kansas City. Outside of banking, Chicago and San Francisco indicated increased investment activity by hedge funds, venture capital firms, and other forms of private equity. Credit standards were reported to be mixed but, on balance, a bit easier in recent weeks. New York, Cleveland, and Atlanta noted increased credit availability for automobile loans; Atlanta, Minneapolis and San Francisco indicated easier credit for some types of business loans. Boston reported some easing in commercial real estate lending, but New York reported tighter standards in that segment. Credit standards on home mortgage loans tightened somewhat in the St. Louis District. A number of Districts noted improvements in overall credit quality: specifically, Philadelphia, Cleveland, Richmond, Kansas City, Dallas, and San Francisco. New York indicated rising delinquency rates on consumer loans but declining rates on commercial loans and mortgages. Overall, the macro level numbers are good. A majority of districts reported an increase in loan demand, and the demand appears across a variety of loan types: residential, construction and commercial and industrial. In addition, credit standards are easing across a variety of loan types. NY: Reports on loan demand were mixed: small to medium sized banks indicate a decrease in demand for consumer loans, an increase in demand for commercial mortgages, and no change in the demand for residential mortgages and commercial and industrial loans. Respondents indicate no change in credit standards for the household sector but a tightening of standards for commercial loans and especially commercial mortgages. Bankers report a decrease in spreads of loan rates over costs of funds for all loan categories--particularly on residential mortgages. There were also fairly widespread decreases in deposit rates. Finally, delinquency rates rose for consumer loans but decreased for commercial mortgages and, to a lesser extent, on commercial and industrial loans. Delinquency rates on residential mortgages were unchanged. Philly: Third District banks contacted in May gave mixed reports on loan volume outstanding. Some posted increases in consumer and business loans, but others reported drops in these categories since the last Beige Book. On balance, total credit extended by banks in the region has been flat in recent weeks. Although some bankers have had recent increases in loan demand from small and medium businesses, most said demand for credit from this sector has been weak. "Loan demand hasn't moved at all," one said, even as competition among lenders has increased. Most of the banks surveyed in May indicated that credit quality has been improving, although some said the pace of improvement has been slow. Looking ahead, the general view among the region's bankers is that loan demand will move up slightly, at best, in the near future. Cleveland: Demand for business loans was stable or grew at a modest pace. Industries driving loan demand were broad-based, with a few of our contacts noting a pick up in construction loan requests for multi-family dwellings. On the consumer side, demand for home equity lines of credit and vehicle purchases (direct and indirect) remains strong, while activity in other installment loan categories was weak. Interest rates for business and consumer credit were stable, but competitive. Half of our contacts noted an uptick in the residential mortgage market, with activity equally distributed between refinancing and new purchases. Overall core deposits continue to grow, especially in demand accounts. The credit quality of business and consumer applicants was characterized as steady or improving. Delinquency rates were stable or trending down across loan portfolios, with the exception of real estate. Staffing levels have shown little change during the past few weeks, and about half of our respondents said that they expect some selective hiring to occur during 2011. Richmond: Lending activity posted modest but broad-based gains across the District over the last few months. Commercial and industrial lending expanded, especially for capital equipment and storage facilities. Several community bankers also cited increasing loan demand from small businesses. These borrowers had new orders from large manufacturers, who were subcontracting to keep up with demand. Consumers were starting to use credit cards again, according to several lenders, and were increasingly seeking financing for autos and home improvements. However, a contact at a large bank in North Carolina reported making very few home equity loans, and most bankers reported seeing little new mortgage lending activity. Most lenders cited improvement in their balance sheet quality, with delinquencies and charge-offs down markedly. Atlanta: Businesses outside of the construction and real estate segments reported a slight improvement in credit availability. Banking contacts remarked that business loan demand had improved modestly, but new firms had difficulty qualifying for credit because of their inability to meet cash flow requirements. Bankers indicated that consumer loan demand remained flat as consumers continued to pay down equity and consolidate debt. Credit availability for auto loans continued to improve. Some firms continued to rely on cash reserves for capital expenditures and expansions. District banks also noted an increase in credit requests from agriculture customers. Chicago: Credit conditions continued to improve in April and May. Corporate funding costs for a number of large firms in the District decreased, and contacts noted that liquidity in corporate credit markets remains ample. Banking contacts reported a slight increase in business loan demand. Although much of this continued to be refinancing of existing debt, contacts noted that they were starting to see more new commercial and industrial loans in the pipeline. Credit availability, however, remained an issue for some small business borrowers. A contact noted that larger banks have recently begun to return to small business lending, but that the loan capacity of community banks who have traditionally serviced this segment is still impaired. Outside of banking, conditions in the municipal bond market improved and there was an increase in investment activity by hedge funds, venture capital firms and other forms of private equity. St. Louis: A survey of senior loan officers at a sample of large District banks indicates little variation in overall lending activity in the first quarter of 2011 relative to the fourth quarter of 2010. During this period, credit standards for commercial and industrial loans remained unchanged, while demand for these loans ranged from unchanged to moderately stronger. Credit standards for commercial real estate loans were unchanged, while demand ranged from unchanged to moderately weaker. Meanwhile, credit standards for consumer loans remained unchanged, while demand ranged from about the same to moderately stronger. Credit standards for residential mortgage loans ranged from unchanged to somewhat tighter, while demand ranged from moderately weaker to moderately stronger. KC: Bankers reported generally stable loan demand, increased deposits, and improvements in loan quality. Overall loan demand was stable to slightly lower in some cases. Demand for commercial and residential real estate loans was generally unchanged, while demand for commercial and industrial loans and consumer installment loans decreased. Credit standards largely remained unchanged in all major loan categories. Deposits increased for the third straight survey. Bankers reported improvements in loan quality compared to a year ago, and the outlook for loan quality was more favorable. The majority of bankers expected bank employment to remain unchanged over the next year, citing low expected growth, cost constraints, and uncertainty about regulations and government policies as the major reasons restraining hiring plans. Dallas: Financial firms reported steady overall loan demand. Large banks with a national footprint reported some pickup in commercial and industrial loan demand with increased corporate activity, and commercial real estate (CRE) activity has shown recent improvement as well. Regional banks noted that loan demand remains pretty flat, although optimism persists for pockets of homebuilding and some CRE lending across the state. Demand for auto and consumer loans declined. Contacts continue to note that loan pricing remains aggressive amidst a highly competitive lending landscape. Outlooks are generally positive in light of better outstanding loan quality and continued slow improvement in lending conditions. SF: Reports from District banking contacts indicated that loan demand and overall credit quality rose modestly since the last reporting period. Businesses in some areas have exhibited a slight increase in their willingness to engage in expansionary capital spending, which caused demand for commercial and industrial loans to rise. Demand for consumer credit remained largely stable. Despite improvements in overall credit quality, lending standards remained relatively restrictive for many types of consumer and business loans. However, contacts reported that competition among lenders to extend credit to well-qualified small and medium-sized businesses has continued to intensify, placing downward pressure on rates and fees. Contacts also pointed to continued growth in venture capital financing activity, driven primarily by investments in the Internet and digital media sectors. -- NY and Philly accounted for the lions share of negative news; outside of these districts, the reports were generally better. -- Alternate financing -- venture capital, private etc.. -- is increasing the role it plays. Yesterday prices printed a strong downward bar. Additionally, the EMAs are bearishly aligned, with the shorter EMAs below the longer and all moving lower. The MACD -- which is already negative -- has also given a sell signal. 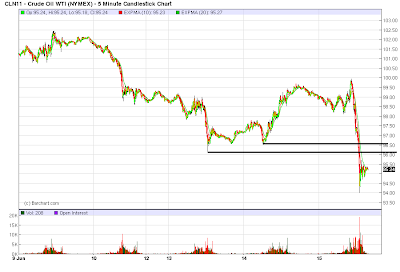 Yesterday's chart shows that prices took a major dive through resistance. There are two options right now. 1.) 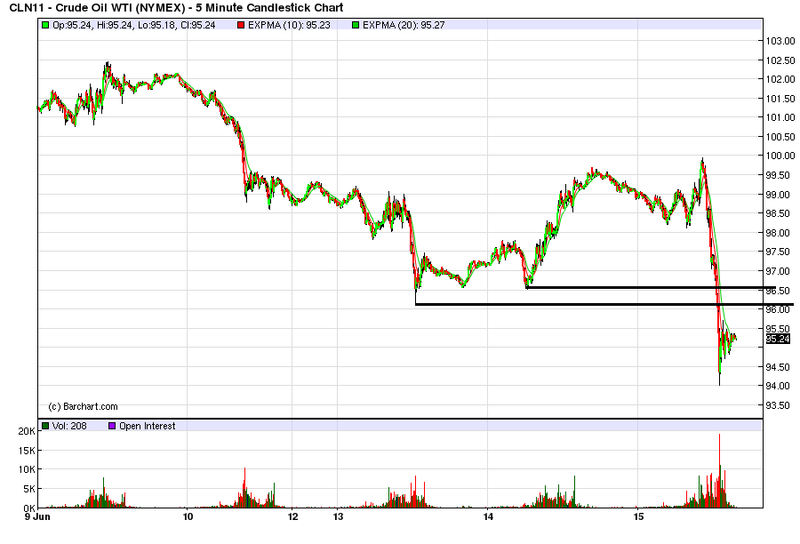 Place a short a bit below yesterday's close. This positioning assumes prices will continue their move lower tomorrow. 2.) Wait for prices to rebound into an area of resistance and then short. When asked about the “single most important problem” facing their businesses, about one in four cited “poor sales,” according to the federation’s survey. Uncertainty over regulations is also mentioned frequently. About a third of businesses blame either “taxes” or “government requirements” for their current troubles, leading some economists to attribute the recent slide in overall business optimism to Washington’s protracted debates over tax policy, financial changes and health care. 1.) Why do something positive if Washington might blow it up in the near future? 2.) Will Washington actually ever solve a real problem in the future? Here are the answers to the above questions. And that is one of the central problems we face right now. Let me add -- I blame both parties equally for this garbage. Let's continue looking at the information from the Beige Book by looking at service sector parts of the economy. Activity in the non-financial service sectors continued to strengthen in most Districts, with the notable exception of St. Louis, which reported fairly widespread declines. Service sector activity generally expanded in the Boston, New York, Philadelphia, Richmond, Minneapolis, Kansas City and Dallas Districts, though Richmond noted deceleration in the pace of growth. There were also pockets of strength in particular sectors. Information technology firms saw activity expand in the Boston, Richmond, Minneapolis, Kansas City, and San Francisco Districts. Employment agencies in the Boston and Chicago Districts indicated continued improvement in activity, while New York and Dallas reported some slowing in this industry. New York, Richmond and Minneapolis cited strengthening in business and professional services, while San Francisco indicated steady to mixed activity in this sector. Activity in the transportation sector improved in the Cleveland, Atlanta, Kansas City and Dallas Districts. Philadelphia and Richmond noted some slowing in growth, and New York reported steady shipping activity, while San Francisco indicated a slowdown in cargo traffic at Southern California seaports. Dallas also reported weakening in container trade volumes but noted increases in cargo volume, railroad shipments and small parcel shipments. Overall, the macro-level information is solid, and indicates the overall environment continues to improve. Seven districts reported an increase, while an eighth (Richmond) is still increasing but at a slower rate. Also note the the breadth of industries showing an increase -- technology, employment and transportation were all cited. Let's look at the district level information. Remember that not all districts report on this activity. Boston: New England software and information technology firms report modest increases in activity through May. Year-over-year revenue increases, ranging from 4 percent to 20 percent, were generally driven by increases in software license revenues, while maintenance contracts grew at a slower rate. Contacts report pick-ups in demand across sectors, including manufacturing, financial, and medical. Increased activity has led to increasing headcounts, many by more than 5 percent from a year ago. Contacts generally cite a tightening labor market, especially for specialized technical positions, but note that it has not resulted in upward pressure on wages. Selling prices are holding steady, although half of responding firms observe less discounting pressure currently than in Q4 2010; in fact, two contacts plan to raise prices modestly later this year. Capital and technology spending is mostly steady, with only two contacts reporting an increase in outlays. The outlook among software and IT services firms remains positive, with most expecting their current rate of growth to continue through the end of 2011. The majority of New England staffing contacts report that business conditions continue to improve, although a few have experienced stagnant or volatile activity over the past three months. Revenues are flat to increasing year-over-year, with increases from 3 percent to 35 percent. Labor demand continues to strengthen, with notable improvements in the information technology, medical, manufacturing, and legal sectors. However, a few contacts lament an elongated hiring cycle, with employers "still waiting for the perfect candidate." Demand for permanent and temporary-to-permanent hiring continues to trend upwards-a sign that "things are heading in the right direction." Labor supply, at least at the high end, continues to be tight in the region. Bill rates and pay rates are steady, with most contacts reporting only modest changes. Looking forward, most New England staffing contacts are more positive than they were three and six months ago, predicting strong growth in the rest of 2011. NY: Reports from business contacts give a mixed picture of the labor market. A major New York City employment agency reports that, after a robust March, hiring activity weakened noticeably in April and early May, though it picked up again in the third week of May. Still, the supply of available workers has dwindled further, and more workers are testing the water and leaving current jobs for new ones. Starting salaries have remained steady and below pre-recession levels. Law firms, in particular, have started hiring more, while financial sector hiring has been stable. A contact in the securities industry reports that the jobs being added there tend to be mostly in support areas, such as legal and compliance, as opposed to revenue-generating areas. Non-manufacturing firms broadly indicate that both business and hiring activity have been steady to modestly higher since the last report. Contacts have become slightly less optimistic about the near term outlook and have scaled back hiring plans somewhat. Non-manufacturing firms report that cost pressures remain widespread but have not broadened since the last report... A trucking-industry contact reports that shipping activity has shown no sign of slipping, despite the recent surge in diesel prices. Philly: Third District service-sector firms contacted for this report generally described demand for their services as growing modestly. Business-service firms noted some increased activity as a result of both greater usage by current clients and demand from new client companies. An executive at a business-service firm said, "Our activity in cyclical sectors is starting to improve." Contacts in the transportation sector reported some recent easing in the slow, steady growth rate that held for the first four months of the year. Contacts in engineering and architectural services reported slight gains in current activity and a somewhat stronger upturn in inquiries. Most of the service-sector firms polled in May expect growth to continue at around its recent pace. Cleveland: Freight transport executives reported that shipping volume expanded for a broad range of manufactured goods, and they expect markets will continue to grow in the upcoming months. Several contacts told us that they are attempting to raise their shipping prices as customer contracts come up for renewal, and they are seeing a slight bottom-line improvement. The price for diesel fuel remains elevated, with most of the increase being passed through to customers via surcharges. We also heard several reports about rising costs associated with recent changes in environmental and federal safety regulations. Capital outlays are expected to accelerate during 2011, if financing can be obtained. Richmond: Contacts at non-retail services firms reported somewhat slower revenue growth in recent weeks. Executives at several healthcare facilities noted flat demand for services over the last month. One hospital administrator also expressed uncertainty about the financial effect on his hospital of the increase in "newly insured" populations under healthcare reform. He noted significant challenges for smaller, rural hospitals with respect to information technology investments needed to secure federal matching opportunities. In contrast, professional, scientific, and technical firms that we survey reported slightly quicker revenue growth. Price growth at services firms was mild, while wage increases were widespread. A healthcare system executive in central Virginia reported that salary pressures were being driven by shortages in some specialties. St Louis: Activity in the District's services sector has declined since our previous report. Numerous casinos in the District have been forced to temporarily close because of flooding on the Mississippi River. Additionally, contacts in the telephone call center, health care, business support, and support activities for transportation industries reported plans to decrease operations in the District and lay off employees. In contrast, a contact in the nursing care industry announced plans to expand operations and hire new workers. Minneapolis: Professional business services firms reported increased activity since the last report. Preliminary results of a mid-year business outlook poll by the Minneapolis Fed found that professional services respondents expect to increase sales and profits over the next year after gains during the past 12 months. The survey also revealed that access to bank credit over the past three months has improved, leading businesses to plan expansions and increase capital expenditures. An environmental consulting firm noted a strong increase in orders from the public sector and slight increases from the private sector. Information technology contacts noted an increase in activity over the past two months. KC: Growth in transportation activity accelerated from the previous survey, and most firms reported optimism about future sales. The majority of high-tech services firms reported strong growth in sales, though the pace slowed a bit from the previous month. Capital spending plans improved for transportation companies, and high-tech and manufacturing firms also reported fairly solid plans for future expenditures. Dallas: Staffing firms reported growth in orders has leveled off or slowed slightly since the last report, although demand remains strong, particularly from the energy, healthcare, insurance and banking sectors. Outlooks are positive, and contacts expect demand to remain stable through year-end. Demand for accounting services increased since the last report, as is typical for this time of year. Improved demand has helped firms raise fees for advisory services. Legal firms noted mostly steady demand, with some strength in corporate, intellectual property litigation, and real estate services. Reports from transportation services contacts were mostly positive. Intermodal transportation firms noted an increase in cargo volumes during the reporting period. Railroad shipments rose moderately, with particularly strong volume growth in grains, metals, petroleum and chemical products. Container trade volumes declined but were up from year-ago levels. Growth in small parcel shipments accelerated during the reporting period buoyed by demand from the wholesale trade and retail sectors. Airline traffic held steady over the past six weeks. Demand for travel within the US and to Latin America was solid, but load factors for international flights to and from the Pacific region remained weak. Contacts expect modest improvement in airline demand and revenue this year. -- The overall read of this report is very solid. Although several districts reported declines in overall activity (NY, Richmond, Dallas) the overall numbers were still positive. -- Two districts that report on transportation (Cleveland and Dallas) reported increases and a solid overall report. -- Expectations were also solid, showing hope for the future. Yesterday provided some perfect examples of the conventional wisdom about the housing market - namely, that recent new declines in the Case-Shiller Index show that we are spiraling down into the double-dip of Doom. ... S&P projects that when all is said and done, home prices will fall 35% from their pre-crisis peak, meaning that we have another 15% downside to go. Yet by historical standards, this will not produce "cheap" prices as S&P suggests, but rather return prices to within historical norms. But whatever bottom is ultimately reached in housing prices, a resurgent housing market will also require an environment that provides reasonable expectations for asset price stability, if not appreciation. And this appears unlikely to happen any time soon. To the contrary, I submit that the above graph shows that there is no descent into the abyss discernable in house prices over the last 2 years. This doesn't mean that real prices can't fall further. But what it does mean is that most if not all of the remaining decline might not be in nominal prices. Nominal prices could easily stabilize while inflation means that the "real" value of housing continues to decline, just as it did in the earlier 1990's. And that brings me back to the 1,000,000+ asking price database from Housing Tracker, which accurately showed the turn in the market in 2006 - a fact I know because I documented it at the time. On Monday, using an unweighted average from the 54 metro areas tracked in the database, I showed that the YoY% decline in asking prices was rapidly abating, and that if the trend continued at the same velocity, a bottom in prices could be reached as early as next winter. The weighted average shows a similar abatement in YoY% declines this year as did the unweighted average I calculated on Monday. Generally we can see that the declines got worse and worse until the $8000 credit was enacted. The declines rapidly abated, and then increased again as soon as the credit expired. (Also, Calfiornia had a temporary, additional $10,000 credit which enhanced the effect there). But the declines have swiftly abated again this year as "real" prices approach their historical norms and inventories continue to decline to lows not seen since 2006. In fact, the 4.5% YoY decline reported for last week is equal to the smallest decline in 4 years. This is a series that, even without artificial government support, wants to continue to trend towards the zero threshold. The Housing Tracker trend in asking prices appears to run 1 to 4 months ahead of the Case-Shiller sales data, which as of the moment is only available through March. Even in the Case-Shiller series, it looks like the YoY% change may be close to bottoming. To put it bluntly, an examination of the newly available aggregate US asking price data from Housing Tracker contradicts the conventional wisdom above that, as "the housing market is only now being left to face the brunt of post-crisis market forces, it is hard to be optimistic about the direction of the housing market," that "we have another 15% downside to go," and that "reasonable expectations for asset price stability, if not appreciation [a]ppears unlikely to happen any time soon." Today, I simply wanted to highlight the grain sector. Recently, the USDA lowered its crop estimate for corn. In addition, weather patterns are still playing havoc with yields etc.. As such, there is little reason to expect big drops in prices going forward. However, with the fear of the projected slowdown in place, there is also downward pressure on prices. As such, we see a prices moving horizontally right now, especially with wheat and soy beans. The overall, national ISM number dropped hard last month. But this number has been printing strong numbers for over a year. 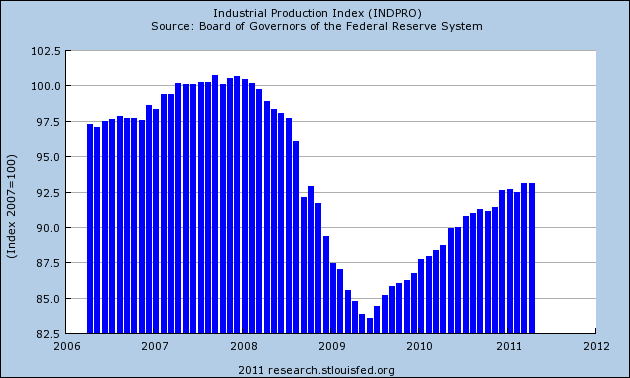 Overall industrial production is still increasing. However, for the last five months, numbers appear to have stalled. While this is not fatal, it does bear watching going forward. Like the IP number, overall capacity utilization has also been increasing, but has stalled over the last five months. 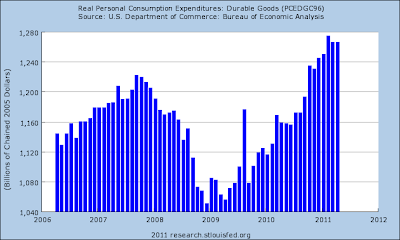 Durable goods have also stalled, but this time over the last four months. The Dallas Fed's overall manufacturing index has been bumping along the bottom over the last year. Future expectations have dipped a bit, but they're still positive. Last month, the Empire State index dipped, but is still very positive. The Philly Fed index dropped hard in its last reading, and is just a bit above contraction. The Richmond Fed index went negative last month. The Chicago Fed's midwest manufacturing index dipped last month, but the overall trend is still positive. Let's continue looking at the Beige Book with a closer look at manufacturing. Here is the national summation. Manufacturing activity was reported as continuing to increase since the last report in all but two districts, although many noted that the pace of growth had slowed. The Boston, Atlanta, St. Louis, Minneapolis, and San Francisco, Districts reported that activity expanded, and the Dallas District reported a pickup in demand; the Philadelphia, Richmond, Chicago, and Kansas City Districts reported that activity expanded but at a slower pace, while activity was reported as steady in the New York District and stable to growing in the Cleveland District. Supply disruptions related to the earthquake in Japan led to reduced production of automobiles and auto parts in several Districts. The Cleveland District noted a sharp drop in auto production, the Atlanta and St. Louis Districts also saw production fall, and auto deliveries were reported as having declined in the Richmond District. The Atlanta District said lost production in its region would be made up later in the year. Contacts in the Chicago District said that contingency plans to deal with supply disruptions were helpful in mitigating the effects. High-tech firms in the Boston and Dallas Districts reported that shortages of parts, due to disruptions in Japan, had adverse effects on business; in contrast, there were few supply constraints that affected technology-related products in the San Francisco District. Growth was reported as strong for semiconductors in the San Francisco and Boston Districts. The Cleveland District reported that steel producers were seeing shipping volumes level off after a strong first quarter performance, and the Chicago District noted a decline in second quarter orders for industrial metals, although orders for the third quarter were coming in at a more positive pace. A contact in the Richmond District said that demand for industrial metals had leveled off. The Chicago District reported a decline in activity for construction materials and household goods. Production remained strong for makers of commercial aircraft and parts in the San Francisco District. Looking forward, contacts in most districts were generally optimistic about the outlook, although less so than the last report. The Cleveland District said that the majority of manufacturing contacts maintained a favorable outlook, although some are delaying the start of capital projects. Contacts were generally cautiously optimistic in the Boston District, although some expect sales growth to moderate. Contacts were mostly positive about the outlook in the Philadelphia District, though the level of optimism was not quite as strong as in the last report. Chicago District contacts expect conditions to rebound in the coming months. A majority of contacts in the Atlanta District planned to increase production. At the highest level, all but two districts reported growth, although at a lower pace. The national summation indicates the Japanese earthquake was a problem across a variety of districts and for a variety of reasons. These disruptions hurt several industries -- not just automobile production. Steel and industrial metals saw a drop-off, although aircraft manufacturing (read: Boeing) reported growth. Let's look at the individual districts. Boston: Business conditions continue to be good at surveyed manufacturers. A parts manufacturer for autos and other vehicles reports that it is struggling to keep up with increased demand. A firm in the semiconductor industry also cites very strong sales growth in the first quarter of this year continuing into the second quarter. Reports from local pharmaceutical manufacturers are also favorable, especially compared with the end of last year, and a company in the medical devices business notes improving sales of its traditional product line after a lengthy period of very sluggish growth. Overall, contacted manufacturers are cautiously optimistic that growth will continue at a reasonable pace for the rest of the second quarter and into the second half of the year. Some firms, however, expect sales growth to moderate somewhat, in part because the second half of 2010 was strong for many respondents. Commodity prices continue to be a concern for manufacturers whose production inputs include petroleum or gas-related products and/or firms that use a lot of metals such as steel. Most of the affected companies have already raised prices with little push-back from their customers, and a number of them plan to implement further price hikes this summer. By contrast, a pharmaceutical company with overseas sales notes downward pressure on their selling prices to government health care systems in Europe, which they attribute to ongoing fiscal imbalances across the Euro-area and related interventions to reduce costs and government debt. Some firms still report modest supply chain disruptions because of the earthquake in Japan (mostly semiconductor-related and other high tech inputs) or worldwide demand-related shortages of selected petroleum-related products. However, one affected firm notes that supply conditions have improved slightly recently and others say they continue to make adjustments to avoid a big impact on their production or sales. Philly: Reports of widespread, robust demand growth for manufactured products as of the last Beige Book gave way to two months of easing in the breadth and pace of recovery. Less than 30 percent of Third District manufacturers reported increases in shipments and orders in May -- slipping from over 50 percent since the last Beige Book. Among key manufacturing sectors in the Third District, the number reporting increases of both shipments and orders narrowed to 7 from 13 since the last Beige Book. The strongest reports of orders came from producers of chemicals; food; stone, clay, and glass; and fabricated metal products. Since the last Beige Book, declines in orders broadened from producers of apparel and rubber products to include producers of electronic equipment and instruments. Failure to pass a multiyear transportation infrastructure reauthorization bill and the ongoing real estate slump were cited by five different manufacturing sectors as hampering the recovery. Third District manufacturers remain mostly positive about business conditions over the next six months; however, the percent of firms expecting increases fell off sharply since the last Beige Book, from 66 percent to 36 percent. Among the firms contacted in May, about 38 percent expect increases in new orders and shipments, while about 20 percent expect decreases. A little uncertainty has crept back into manufacturers' expectations, with several contacts citing "swings" in activity. Capital spending plans over a six-month planning horizon have changed little since the last Beige Book, with about one-third of firms projecting increases. Cleveland: Reports from District factories indicate that production was stable or slightly up during the past six weeks, with a moderate rise in backlogs. A majority of our contacts maintain a favorable outlook, some of which was attributed to strength in offshore markets. However, several manufacturers said that market conditions are beginning to soften. Many steel producers and service centers reported that the rise in shipping volume seen in the first quarter is beginning to taper off, due in part to pricing issues and declines in consumer demand. Shipments are being driven by capital goods, autos, and energy-related industries. They anticipate volume remaining at current levels until a seasonal slowdown, which typically occurs during the third quarter. District auto production dropped sharply during April on a month-over-month and year-over-year basis. Most of the decline was due to supply disruptions caused by events in Japan. Manufacturers remain committed to raising capital outlays in the upcoming months relative to year-ago levels. Nonetheless, about a third of our contacts reported that they are delaying the start of some projects. 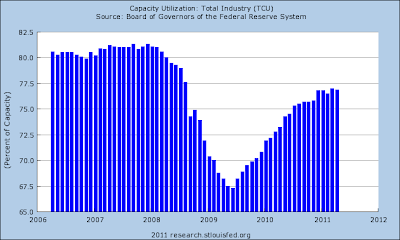 Capacity utilization rates are below what is considered normal for a majority of manufacturers. Prices for metal and agricultural commodities, steel, and petroleum-based products remain elevated. Most of our contacts reported passing through some of these higher input prices to their customers. A few producers commented that steel and scrap prices have peaked and are expected to begin falling back. Manufacturers continued hiring at a modest pace, with most new hires being higher-skilled workers. Several contacts also noted a slight increase in wage pressures. Richmond: District manufacturing cooled in May after expanding for seven months. Several textile and apparel contacts described their business as being unpredictable, with "very little depth." Similarly, a producer of coated steels mentioned that, although the first quarter had been fairly strong, order volume had been going down since then. Also, a supplier of specialty materials reported that his business had leveled off in recent weeks because demand for his customers' goods had slowed. Several contacts stated that the disruptions in Japan had affected automotive deliveries, due to lack of electronic components and paints. Firms reported that their customers were strongly resisting any price increases, despite knowing that commodity prices were rising. Our latest manufacturing survey revealed that prices of raw materials rose notably over the last month, but prices of finished goods were up only moderately. Atlanta: District manufacturers noted an increase in new orders and production in April and May. The majority of contacts planned to increase production in the short-term. The exceptions were auto producers and parts suppliers that experienced input constraints stemming from the Japanese earthquake. However, these contacts reported that lost production would be made up later in the year as supply channels returned to normal. District ports reported increased volumes in cargo and shipments. Air cargo contacts noted that tonnage was returning to near pre-recession levels. Railway firms cited strong increases in exports of chemicals, coal, and other energy-related products to China and India. The flooding of the Mississippi River is not expected to cause long-term disruptions to maritime traffic. Chicago: Manufacturing production growth slowed from the previous reporting period, although contacts expected the recent slowdown would be temporary with conditions expected to rebound in the coming months. Capacity utilization in the steel industry was only marginally lower; and while other manufacturers of industrial metals noted a softening in orders for second quarter delivery, several also indicated that order books for third quarter delivery were more positive. A contact speculated that the recent volatility in industrial metals prices was leading some customers to delay orders, expecting lower surcharges in the coming months and to avoid getting caught holding inventory at elevated prices. Manufacturers of construction materials and household goods also reported a decline in activity. In contrast, orders for heavy trucks, agricultural and construction equipment were up. Fleet replacement and robust activity in oil and gas extraction were cited as reasons for the continued strength in demand for heavy equipment. Supply chain disruptions reduced activity in the automotive sector, but mostly for the Japanese automakers and their suppliers. District automakers were able to avoid the most severe dislocations by reallocating parts to vehicles that are in high demand and implementing contingency plans for alternative supply sources. Contacts indicated that while it remains to be seen how effective these measures will be over an extended period, these supply chain adjustments were occurring at a faster rate than previously expected. In addition, a contact noted that some automakers and their suppliers are moving planned summer shutdowns forward into June to give supply chains time to repair and thus be in better position for a ramp up in production in the third quarter. St. Louis: Manufacturing activity has continued to increase since our previous report. Several manufacturers reported plans to open plants and expand operations in the near future, while a smaller number of contacts reported plans to close plants or reduce operations. Firms in the tire, powder coating, food, paper, packaging, machinery, automobile, and ship manufacturing industries reported plans to expand existing operations and hire new workers. In contrast, a firm in paper manufacturing announced plans to close a plant and lay off employees. Additionally, some automobile manufacturers have reduced their production because of a shortage of parts sourced from Japan. Minneapolis: Manufacturing activity increased since the last report. A May survey of purchasing managers by Creighton University (Omaha, Neb.) showed increases in manufacturing activity in Minnesota, South Dakota and North Dakota. A Sioux Falls manufacturer of electronics and aerospace products is expanding its operations. A bank director reported that manufacturers saw higher productivity and increased their equipment purchases. KC: Growth in District manufacturing activity slowed following rapid growth in recent months, while other business activity expanded further. Factory orders declined after surging earlier in the spring, but factory hiring continued at solid rates and firms remained relatively optimistic about future sales. Growth in transportation activity accelerated from the previous survey, and most firms reported optimism about future sales. The majority of high-tech services firms reported strong growth in sales, though the pace slowed a bit from the previous month. Capital spending plans improved for transportation companies, and high-tech and manufacturing firms also reported fairly solid plans for future expenditures. Dallas: Most construction-related manufacturers noted a pick-up in demand since the last report. Some of the uptick was seasonal and expected, but several contacts said that it was difficult to separate out seasonal demand from improved business conditions. Public projects still account for a large share of orders, but contacts said demand had increased because of an acceleration in private projects such as apartment and commercial buildings. The one exception was the lumber industry, where responses mostly reflected weaker conditions over the past six weeks. Respondents in high-tech manufacturing said sales and orders remain strong overall, but demand was mixed. One source of weakening demand was the ripple effects of the natural disaster in northern Japan as shortages of parts fed into slowdowns in demand for complementary parts. Several respondents noted a broad pickup in consumer demand from India and China and, within the US, an increase in demand for products such as 3-D televisions, tablets and smart phones. Contacts also reported an increase in orders for semiconductors due to a pickup in demand from the industrial, medical and auto sectors. Reports from most paper manufacturers reflected stable to improved orders stemming from broad-based economic strengthening. Transportation manufacturing firms said orders were strong and several said demand had risen slightly since the last report. Respondents in the food industry said sales continued to increase at a steady pace over the past six weeks and outlooks remained positive. Petrochemical firms said supplies were very tight, in part due to restricted capacity caused by unplanned domestic plant outages, as well as reduced production in or near the Japanese earthquake zone. Demand remains strong for most products, and prices are rising. High profits and strong margins for ethylene producers have led to announcements of several new plants and expansions in the Gulf Coast and elsewhere. Refiners reported extremely strong profit margins, and said domestic gasoline inventories were near the bottom of the normal range. SF: District manufacturing activity posted further net gains during the reporting period of late April through the end of May. Manufacturers of semiconductors and other technology products reported continued growth in new orders and sales as well as high levels of capacity utilization, with few supply constraints arising from the crisis in Japan. Activity fell slightly for metal fabricators, as demand growth eased in the wake of strong gains in preceding months. Production rates remained solid for makers of commercial aircraft and parts, with modest growth in new orders adding to an existing order backlog. Capacity utilization rates dropped a bit for petroleum refiners, as domestic demand for gasoline stalled in response to elevated prices. Reports from food and beverage manufacturers indicated that demand for their products was largely stable or up somewhat. 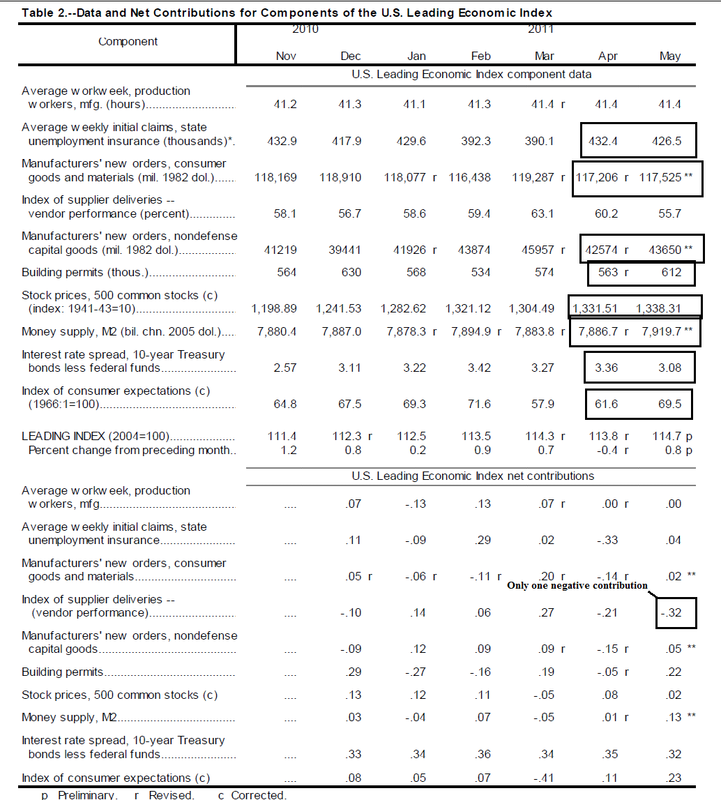 -- What is missing from all of the above summations is any indication that manufacturing is in trouble. While several districts noted a slowdown (Richmond, Philly, Chicago, KC) there was no indication that market participants thought these declines were widespread. Additionally, several districts attributed the slowdown to Japan. -- High-tech manufacturing is doing very well. -- Steel production seems to be leveling off. -- There is still confidence in the future, adding further credence to the argument that the recent slowdown is temporary. Overall, I'd take profits in TLTs if you made the trade, but I'd still keep in the IEFs; there is no sign they are going to be ending their rally soon. In addition, there is still concern about a weakening economy. My concern at the time was the MACD on the TLT, which was then giving a sell signal. Let's take a look at the charts. Prices have broken the upward sloping trend-line, which is rarely a positive development. Also take a closer look at the price. It's dipped and then rallied, but not above previous peaks. 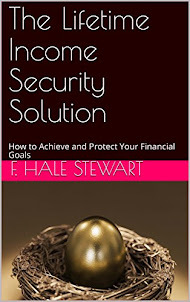 First, see this post from last week, where I look at income, spending and commodity prices. Let's start by looking at overall real PCEs -- which are clearly in an uptrend and are now above pre-recession levels. Service expenditures comprise about 65% of PCEs. This component of PCEs are also in a strong uptrend and are above pre-recession levels. 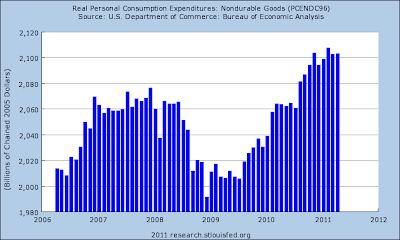 Non-durable goods comprise about 20% of PCEs. 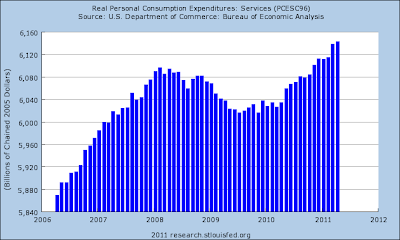 This component is above pre-recession levels, but note the upward move has slowed over the last few months. This type of slowing is evidence during other parts of the recovery, so it's not fatal. But it does bear watching. Durable goods as a percentage of PCEs is also increasing and is above pre-recession levels. However, the last three months, this data series has also slowed its upward move. This has happened before, so, again, it's not fatal. But it does warrant some caution going forward. 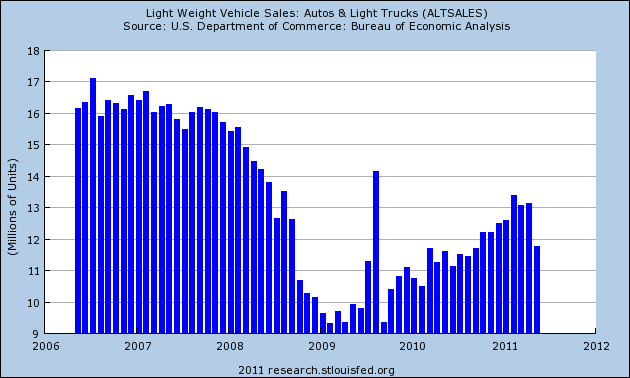 Auto sales were doing well, but dropped sharply last month. Because durable goods require financing -- and therefore a confident attitude about the next 3-5 years -- this drop is especially troubling and needs to be watched closely. 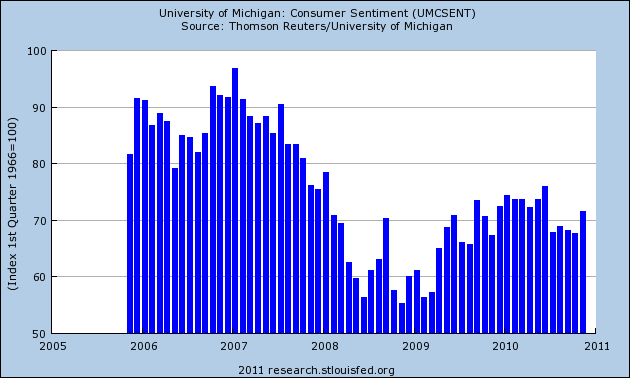 The University of Michigan's confidence index has been stalled at low levels for about a year. The reason is simple: unemployment is over 9%, job growth has been weak and wage growth has been slow. Despite low confidence, the overall numbers are encouraging. Most importantly, they do not point to a "sky is falling" scenario. They do indicate the consumer is under obvious pressure from a weak job market and high commodity prices. These two factors are leading to a slowing of overall purchases and the drop in auto sales. 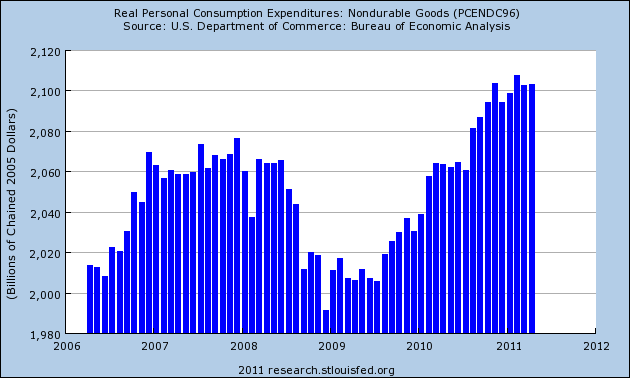 But, again, there is nothing in the data that says a consumer spending contraction is on the way.